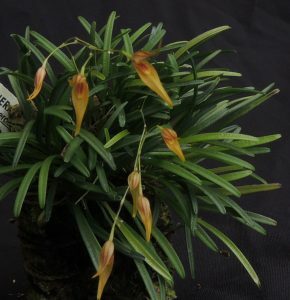 This is a miniature species widely distributed across South and Central America. The 2mm wide flowers are relatively large for the plant and sprays of up to six flowers all open together. The plant grows in wet montane forest up to 2100m and so enjoys growing mounted in Cool Americas in shade and with daily watering. Very small species like this do best for us mounted as moss is less likely to out compete the plant than if potted.